Welcome to the 2013 Stanley Cup playoff picks! The short season breezed by, and all of a sudden, it's playoff time! Don't forget to enter the Second Annual Atom-Bomb Bikini Playoff Challenge at the bottom of this post to win some art, books, stickers and other great stuff! The Pittsburgh Penguins are all-in. GM Ray Shero, sensing the time was right, made several colossal moves at the trade deadline, bolstering an already star-laden team with grizzled veterans and key role-players hungry for success and a chance at winning their first Stanley Cup. They finished the season with a 22-3 record vs. the rest of the Eastern Conference playoff field. There will simply never be a better chance for this team to succeed, and there is no excuse for them not to. The Islanders are a good, speedy young team, with a bona fide star in John Tavares. However, most of the team's playoff experience comes from goaltender Evgeni Nabokov, who has never done particularly well in the postseason in multiple trips with San Jose. No team has broken Pens' fans hearts over the generations in quite as spectacular a fashion as have the Isles. This, though, will be the year the Pens exorcise the demons of 1975, 1982 and 1993. It won't be easy, but Pens in five. The Habs have been good all year but have been disintegrating before our eyes since mid-April. A strong final weekend, and a lousy weekend by the similarly fading Bruins, enabled them to hang on to the Northeast Division title and the second seed, but it all seems to be hanging by a thread. Ottawa has overachieved all season, especially in light of star D-man Erik Karlsson being totally injured on purpose by international master criminal Matt Cooke and missing three months, and my gut says they'll continue to do so against a Montreal team that sometimes looks like it just wants it all to be over. Senators in six. Caps and Rangers. Really? Again? Sheesh, get a room, you guys. The Caps, left for dead at midseason, came to life in March, and went on a tear and managed to seize control of the Southwest division when the Hurricanes and Jets faltered. Alex Ovechkin, similarly left for dead, cut his hair and rediscovered his spark, and may have played well enough to win the Hart Trophy. Lousiness of their division aside, these Caps suddenly seem for real. The Rangers, once a heavy favorite to win the Stanley Cup, have been mired in the middle of the pack all season, but have been playing better of late and managed to climb into sixth place in the conference. They've had a hell of a time scoring, relying on goaltending and blocked shots to win a lot of 2-1 games. If New York's offense can find an extra gear, they might be able to escape with a win in a close series. I'm not sure they are capable, though, and I think relying on a "score-two-then-block-every-shot" strategy will come back to bite them. Caps in seven. Last May I made my first trip to Toronto as an adult, to finally check out the Toronto Comic Arts Festival. 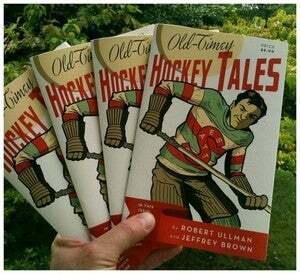 My Old-Timey Hockey Tales comic book was as well-recieved as I ever could have hoped, and did incredibly well for me at the show. I really can't remember a time where I talked to so many different kinds of people about the wonderful sport of hockey (many of them frustrated Maple Leafs fans) in such a short amount of time. This year's edition of TCAF will take place next weekend, and I'm insanely bummed that I'm not going to be there to soak up the excitement with the Leafs actually involved in a playoff series. What's that? The Leafs are involved in a playoff series? That can't be right. The Toronto Maple Leafs? What's it been, like, 20 years? Well, not quite, but close. Toronto is finally appearing in the postseason again for the first time since 2004, and with solid goaltending and a speedy roster capable of scoring timely goals, they look to stay around awhile. Boston, on the other hand, are a team that looks to be running out of steam. A strong start has given way to a floundering finish. On paper, perhaps only the Penguins can match the Bruins for talent, depth and intensity. However, I expect that Boston will continue to struggle to score, and that the jacked-up Leafs will take advantage of enough opportunities to win the series. I'll take the Leafs in six. The Minnesota Wild, probably the biggest spenders in the NHL last offseason, have to be kicking themselves over getting drubbed at home by the lowly Edmonton Oilers the second to last game of the regular season. The loss enabled the Red Wings to vault ahead of them into a matchup with the Anaheim Ducks, and landed Minnesota in the unenviable position of being the first sacrificial lamb to the mighty Blackhawks juggernaut en route to the Western Conference final. Blackhawks in five. The Anaheim Ducks started off the season remarkably well, somehow keeping pace with the torrid pace at which Chicago was winning for a time. But while the Hawks continued to win and cruised to the top of the Western Conference, the Ducks have fallen back to the pack a good bit, looking downright vulnerable at times. The Red Wings, in their first season without captain Nick Lidstrom and a host of other former stars, had to scrape and claw just to keep their streak of making the playoff in 22 straight seasons alive, not clinching until the season's last day. While seventh place is not a place in which the Wings are accustomed to being, the second round of the playoffs is, and that's exactly where they'll be after dispatching the ripe-for-an-upset Ducks. Red Wings in six. I find it hard to believe the Canucks will get bounced from round one in a second straight year...especially at the hands of the streaky Sharks, who've been up and down all season. San Jose has been extremely good at home, which may be the factor that lets them go the distance...but I still look to see the Canucks in seven. These same teams faced one another in round two last year, just as the Kings historic roll of four straight 3-0 series leads was really getting underway. Los Angeles has been a little inconsistent in their title defense after an especially slow start, but lately the team, largely intact from last year, seems to be on the verge of another roll, with goaltender Johnny Quick playing very well. The Kings are still the champs, and it's gonna take more than the Blues, tough as they are, to knock them off the perch. Kings in six. As with last year, the rules are simple...pick the final four teams you think will be left standing, the conference champions, and the eventual Stanley Cup winner. One point will be awarded for each correct final four pick, two for each final two pick, and three for picking the champion. Whoever has the most points when it's all said and done will take the big prize! Here's what you're playing for: The big winner will receive a custom piece of original artwork of a pinup girl wearing the jersey of his or her favorite team, along with a copy of my collection of hockey-themed commissions, Bluelines, a copy of Old-Timey Hockey Tales, a pack of Atom-Bomb stickers, a signed "Hockey Socks and Skates" print by Katie Sekelsky and a free t-shirt of your choice from the wonderful folks at Original Retro Brand! Two runners-up will just get the books and stickers...and in case of a tie, I'll put all the names in a smelly old hockey helmet and select a winner at random. You have until the pucks drop on Tuesday night to enter! I realize that isn't a lot of time...blame the lockout, the situation in Boston, my kids...basically anyone but me. Please remember to check back as the playoffs progress...I'll post the winner's names here, and at that time I'll look to get in contact with you. And please, do remember to check back! One of the prize packages went unclaimed last year, as I had no way of getting in contact with the winner...If you have a Twitter handle or something like that that you wouldn't mind adding to the post, that'd be great. So, enjoy the hockey, and good luck! 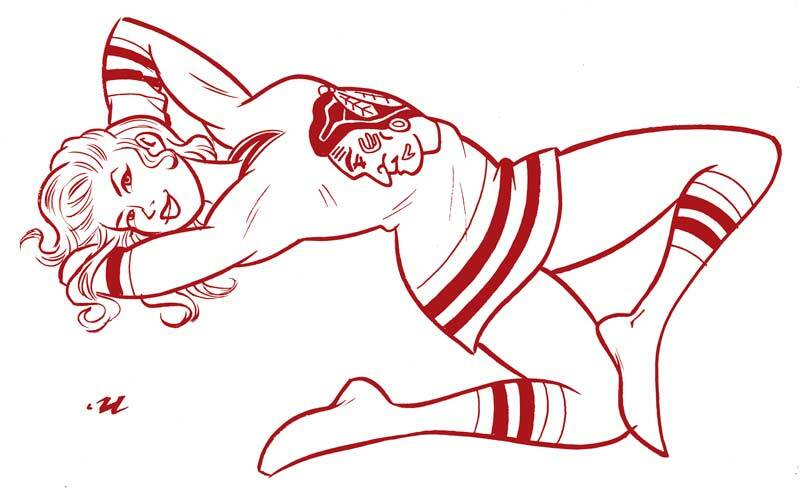 CRASS COMMERCIALISM DEPT: All of the original, hand-drawn art for this year's Stanley Cup picks will be on sale soon...but all of last year's art is currently available at my Etsy store, and on sale for 25% off through the month of May, when you use the code CUP13 at checkout! I took one of my recent Dr. Sketchy drawings of local burlesque performer Puppie Buffe and printed it out in bluelines, just to give myself a little inking practice. 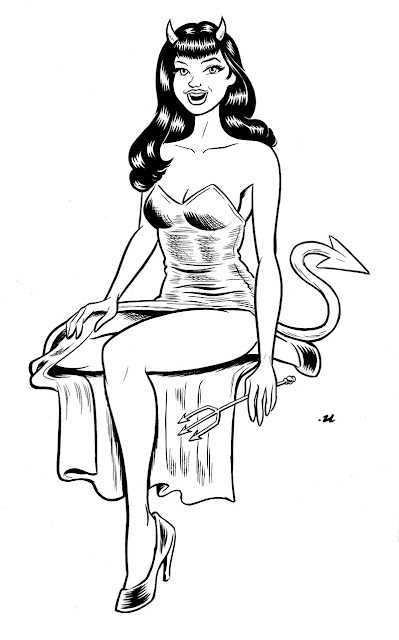 I've been revisiting Dave Stevens' art quite a bit lately, and I thought I'd try and work some of the observations I've made about his inimitable style into my own work. Might as well try to turn water into wine! Anyway, I plan to further embarrass myself by coloring this...stay tuned!